『Universal Design 3 in 1』The buckle could be attached on the camera strap. Each buckle holds three sizes of lens caps on opposing sides of the holder. Fits most lens caps including Canon, Nikon, Sony, Olympus, Fuji, Pentax, Panasonic, Sigma DSLR/SLR/EVIL Cameras and more..
『Premium Material Produced』Lightweight & durable ABS plastic material. Prevent lens from dirt, dust and damage..
『Double Security anti-lost 』Center pinch design allows easy attachment and removal of lens cap from the buckle, as well as side pinch deign. This buckle works well on preventing losses with the lens cap leash included..
『Easy and Safe 』Easily attaches to your camera's neck/shoulder strap/bag strap and no extra modification of your camera or lens cap is required. 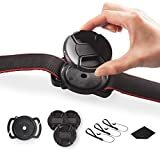 Avoid losing your lens cap during shooting sessions on the go..
『Package Includes』1*camera lens cap anti-lost buckle(52-67mm), 3*lens cap hood(Work for 52mm 58mm 67mm lens cap),3*connector buckle,1*cleaning cloth. It is a much easier and more secure way to hold spare lens cap or replace lens cap on the go. This kind of buckle is designed to match multi-size of lens caps on opposing sides of the holder which is easily attached on the camera strap belt.『Universal Design 3 in 1』The buckle could be attached on the camera neck strap, camera bag or key chain. Each buckle holds three sizes of lens caps on opposing sides of the holder. Fits most lens caps including Canon, Nikon, Sony, Olympus, Fuji, Pentax, Panasonic, Sigma DSLR/SLR/EVIL Cameras and more.『Premium Material Produced』Lightweight & durable ABS plastic material. Prevent lens from dirt, dust and damage.『Double Security anti-lost 』Center pinch design allows easy attachment and removal of lens cap from the buckle, as well as side pinch deign.Also,center pinch design allows len caps removal conveniently when using camera hood. This buckle works well on preventing losses with the lens cap leash included. 『Easy and Safe』Easily attaches to your camera's neck/shoulder strap/bag strap and no extra modification of your camera or lens cap is required. The compact design enables simple portability. No dangling cord, will not interfere with lens, camera. 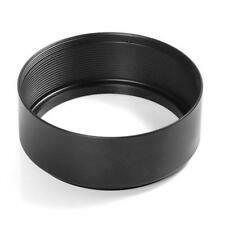 Protect your lens cap, prevent your lens cap lost when you take pictures or photography. 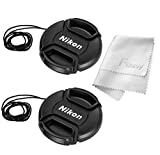 Avoid losing your lens cap during shooting sessions on the go.Package Includes：1*camera lens cap anti-lost buckle(52-67mm)3*lens cap (58mm+62mm+67mm)3*connector buckles1*cleaning clothNote:The strap and lens cap showed are not included.